Distance: 2.4km (For all). 1.3km of there-and-back spur options (For many). Turning point: St. Catherine’s Church – grid reference: NY 176002 or at the south end of the Tramway path – grid reference: NY 177002. Getting there: Train: Ravenglass and Eskdale Railway can accommodate wheelchair users. Details on www.ravenglass-railway.co.uk (opens in new window). 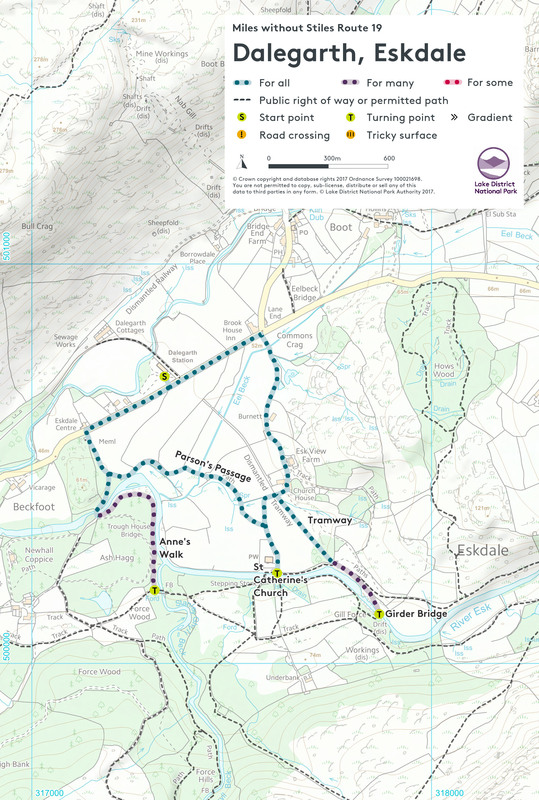 Car: turn right into Dunnerdale before Duddon Bridge and follow signs for Eskdale Green over Birker Fell. From the coast, take the A595 north from Ravenglass and turn right on a minor road signposted Santon Bridge and Eskdale. Dalegarth station is 10 km up the valley. Esk. After just over 150 metres, at the crossroads, the right turn takes you down to St. Catherine’s Church (12th Century), and the River Esk; a good spot to linger, sit on the bench and take in the woodland and riverside setting. loop which takes in the route of an old railway track from Eskdale’s mining era. At the bottom of the Tramway, there is an option “for many” to continue along a short, narrow stretch to the Girder Bridge (built on two railway girders). To return to Dalegarth Station, continue on the main stone track past Esk View Farm on the right, until it becomes a smooth tarmac road. Take care as you reach the Brookhouse Inn and the main road once more. Turn left onto the main road and after just over 200 metres you will see Dalegarth station on the right. * A short distance up this road you come to Trough House Bridge. This arched stone bridge crosses a dark chasm gouged out by the River Esk. On the other side of the bridge, a gate on the left leads to a delightful new spur path ‘for many’, called “Anne’s Walk”, in memory of Anne Stanley of Dalegarth Hall.